Can I Notarize An Incomplete Document? Please advise whether it is legal to notarize an incomplete document in the state of Idaho. Thank you. I get many emails inviting me to join notary directories and other related databases, requesting info about my personal information (SSN included) ... some requiring fees to "join" their database in order to "built your business". How can I evaluate these offers to see if they are legitimate, or just scams to get information or money? 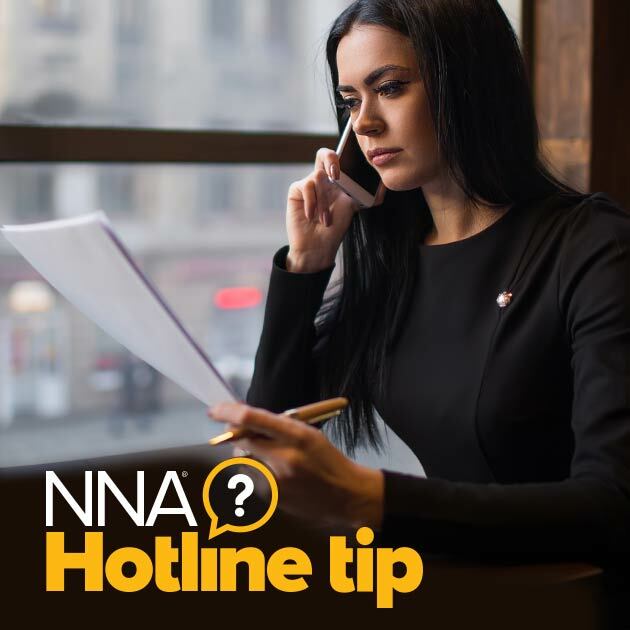 Hi Patricia, We suggest you contact other Notaries to ask their views about directories and databases they are listed with. A good way to find and speak other Notaries is joining our Notary General Discussion Group on LinkedIn at https://www.linkedin.com/groups/NNA-Notary-General-Discussion-Group-112982?mostPopular=&gid=112982. Oddly enough, California is one of the biggest offenders when it comes to sending me e-docs with missing legal descriptions (also constituting an incomplete document) with the standard excused "Oh, we attach the legal description before we record." Of course, I refuse by telling them, as politely as I can, that "I do not notarize incomplete documents." I've never had anyone refuse to send one, it is just that extra step I have to take in the vast majority of signings. Because of the time difference from mainland and Hawaii, escrow or even signing service people are rarely available to discuss other blanks left in a document so I instruct the signer to line out any blank spaces and initial. I find it really amazing that these "professionals" send documents to us in this manner and yet will be the first to require that we, as Notary Signing Agents, be "accurate" in our work or fact a financial penalty. I don't mind that because I should be accurate for the fee I am being paid, but if we could charge for every error or omission made from the other side, I would have retired by now . At ansigning, i was provided a document to Notarize with the Husband only. However, the wife name appeared on the document also. I informed the loan officer that I would only sign and notarized the document if I was able to N/A the wife signature line because I could not leave it blank because the wife or someone other than the wife could sign later not in my presence. The loan officer agreed and allowed me to N/A the wife name everywhere it appeared on a form I was to sign and notarize. Was my actions appropriate? Hello. Crossing out the other signature line may cause issues when the other spouse must sign the documents.Technically, the Notary may notarize the signature of one signer on a document with multiple signers. The key is for the notarial certificate to name only the name of the signer who appeared before the Notary and signed the document. Later, the other signer may appear before the same Notary, or another Notary, and that Notary can complete a separate certificate naming the signer who appeared before the Notary on the later date. Hi, recently, I've sold property in louisiana. The deed for the property was notarized in Nevada (where I currently live). The deed for the property to be sold required two witnesses signatures. The notary notarized my document with only 1 witness signature, and two spaces for the second witness to sign were left blank. I was told by the notary that I can leave and have someone I know sign and date the other signature spaces, so I got someone to sign. Was this okay forme to do? Hello. We're sorry, but we can't answer this question. You would need to contact an attorney or real estate professional authorized to answer questions about your real estate transaction to find out if the signature is legally acceptable. I notarize a lot of construction invoicing where there is a section/box for another signer (architect) that are not completed. The area that my notarization covers is complete. Would this be considered incomplete as far as my ability to notarize? Hello. If there is a section of information in the main body of the document that needs to be completed by another person, generally the document would be considered incomplete. However, if the main body information in the document is complete and signed, but there is additional blank signature space for another signer at the end , this is considered an "acceptable blank" and you may notarize the signature that has been made on the document. In such a case, you should make a note in your journal entry that there was blank space left for an additional signature, but be sure to only notarize the signature that has actually been written on the document and follow all requirements of your state law. Hi, in the state of Texas does a document have to be typed as opposed to handwritten and is it mandatory for the affirmation statement to be typed and not handwritten? Hello. Texas does not specify if a document or notarial certificate must be typed out or handwritten in order to be notarized. Four siblings in three states get a group of papers to have notarized in a real estate sale, however, on one page all the signatures are required with designated lines for each signature. If the first notary in one state notarizes that one sheet, isn't that sheet layout incomplete, shouldn't she be required to cross out the lines and initial that she's not notarizing those signatures should they appear later, or is she notarizing just the one signature of four since it states that one sibling in text underneath? The next page in the document has three remaining places to notarize for each designated sibling.